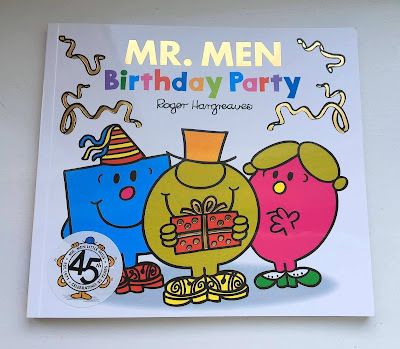 This year marks the 45th birthday of Roger Hargreaves ever-popular characters, the Mr Men. Mr Tickle was the first book to be published, and as it was also the year I was born, it's probably no coincidence that Mr Tickle was also my first Mr Men book. To celebrate the 45th birthday of the Mr Men a series of 4 new books and a special edition Mr Men Birthday Party Book are being released. The Birthday Party doesn't quite go to plan. 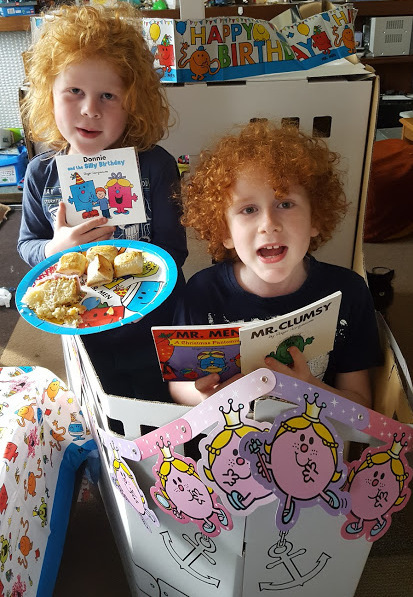 It's Mr Silly's birthday and some of the Mr Men are not really capable of organising a party in spite of their best intentions! The Mr Men Birthday Party book costs £2.99 and delivery is currently free on Amazon Prime. 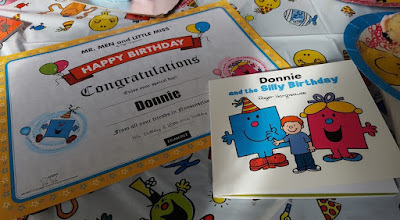 This week marks what would have been Roger Hargreaves 91st birthday, and we were invited to have a party to celebrate. It was decided we may as well decorate our Pirate Ship! We were sent some great Mr Men partyware, and we grabbed a few of our Mr Men books from the bookshelves. 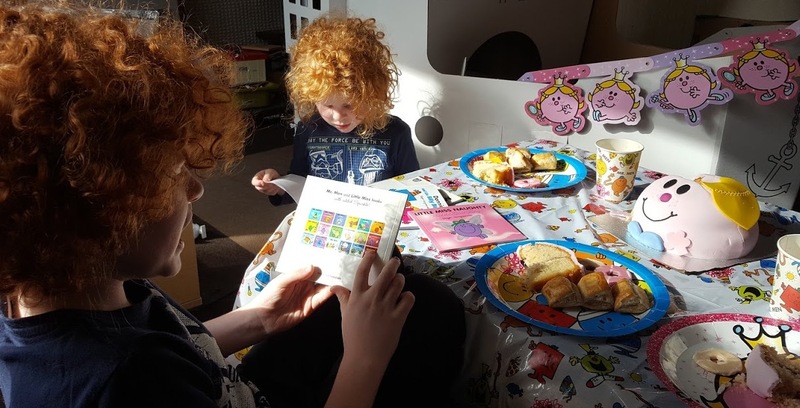 It's the first party I've been to where everyone gets sidetracked from eating the party food to read books....(thanks to Tesco for the Little Miss Princess cake). We had the brand new personalised Silly Birthday Mr Men book to read. 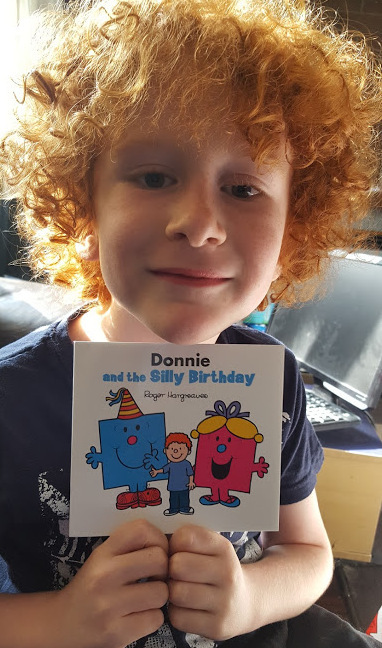 It's actually just been my youngest child's birthday, but he thought it was so hilarious he could make the character look just like his brother that he wanted to make the book for him. 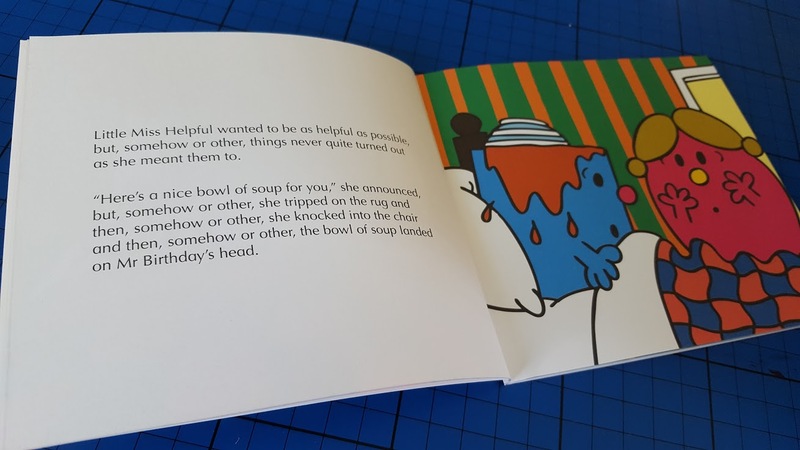 You can create your own personalised Silly Birthday Mr Men Book in a couple of minutes - and I have a 20% Discount for my readers. 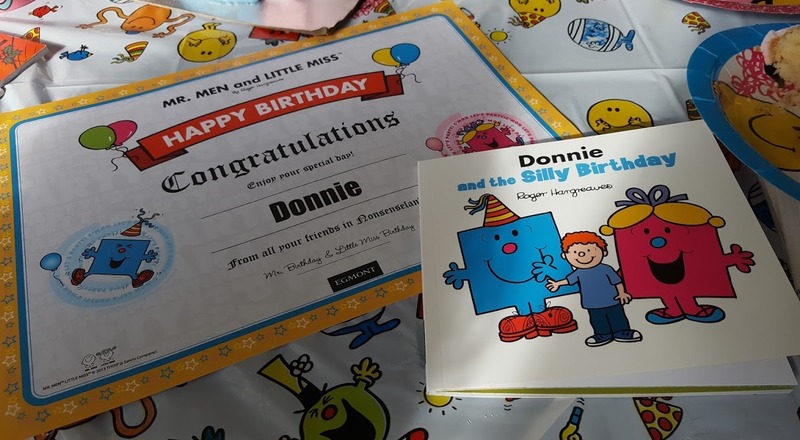 The personalised books take around 2 weeks postage and cost £8.99 as a story library edition, or £12.99 as a gift edition, and arrive with a really smart birthday certificate. 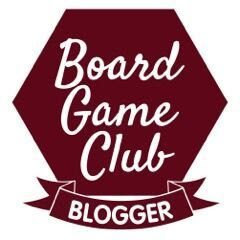 To get 20% off, use the code pblogger20 and your personalised book will only cost £7.20 or £10.40 for the larger format gift edition. 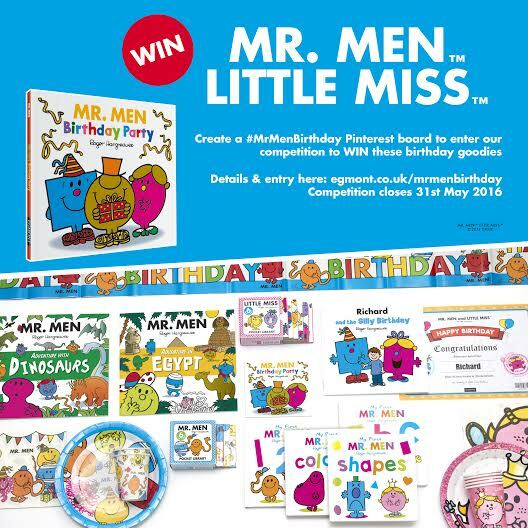 To celebrate the Mr Men and Roger Hargreaves' Birthdays, Egmont Books and the Mr Men are celebrating in lots of ways, and another one is a Pin to Win competition over on Pinterest. One lucky person will win a massive bundle of books and partyware. 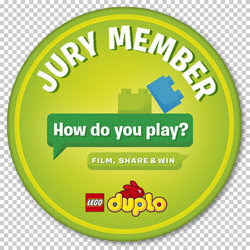 All of the information you need to enter can be found on the Mr Men Pinterest Competition page. 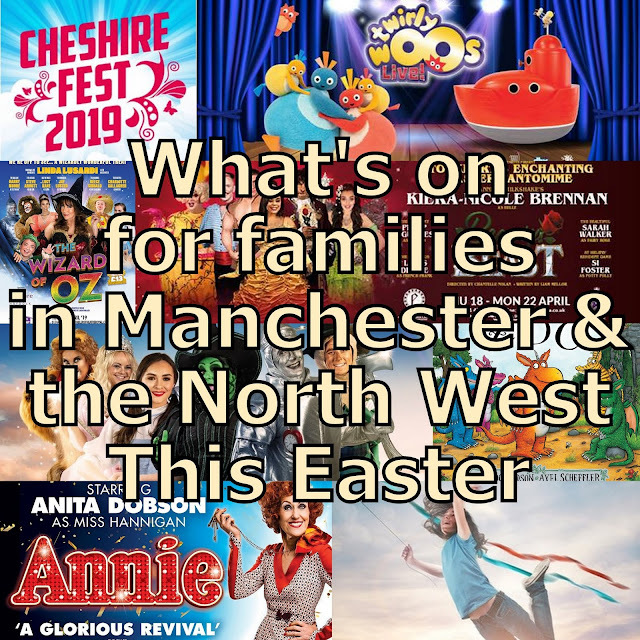 We were reimbursed for the time taken to administer this giveaway, and we were sent the partyware, Tesco birthday cake and Mr Men Books for the post. 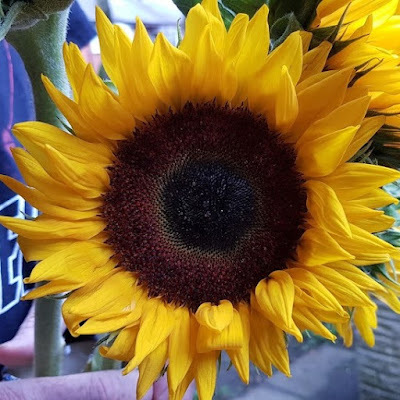 Image credit to Eileen as we'd got party food on ours! When I was little I always loved Mr Tickle because I loved to be tickled and Mr Tickles arms reminded me of Heinz spaghetti! Mr Greedy was my favourite - as a little girl I was astonished at how much food he could fit in his belly! 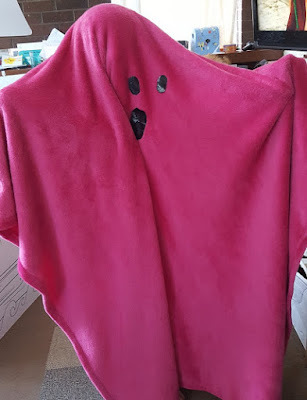 Mr Fussy was our favourite and was most often referred to at dinner time when vegetables were served. I've always liked Mr Bump because he's like me, forever bumping into things! Mr Nosey because I am a little nosey too. Mr silly because along with his best friend mr nonsense has whacky adventures that make my little boy laugh. I like Mr Bump as he reminds me of my husband! I like Little Miss Chatterbox because she sounds just like me. I just love the way Mr Tickle always makes light of the situation! my bump - reminds me of my partner - hes a walking accident! Mr Bump because it reminds me of a bumping game we played when I was young. Mr Bump as he's been my favourite since I was a child! 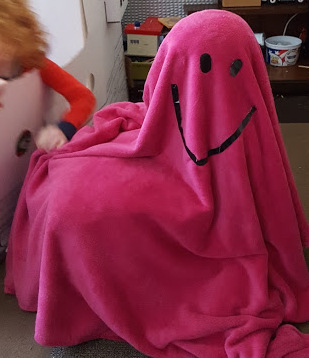 Mr Tickle as he looks a lot of tickly fun! My favourite is Mr Jelly because of the fact he is jelly! Little Miss Chatterbox because she is like me!